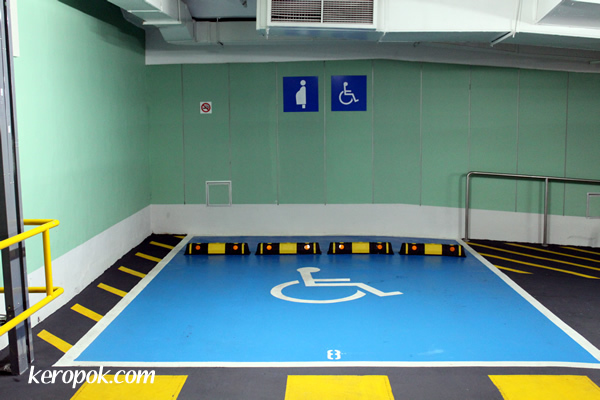 I saw this car park space at the NTUC Income at Bras Basah and saw that the disabled parking space can be used by pregnant mums too! What a brilliant idea isn't it? This reserved space is usually empty. Oh by the way, what you see is a "parking space" and not a "parking lot". I recently 'learned' the correct term. Many people in Singapore will say they are looking for a parking lot in the car park. Very wide and clean! I guess they appreciate it when they can find such a parking space! In the US a vacant parcel of land is called a vacant "lot". When you park cars there it becomes a parking lot.